Remember the day when the big-red-and-white Borders bookstore popped up on a commercial business corner near you? They had their avid book-loving followers and their loyal independent-bookstore-going boycotters. 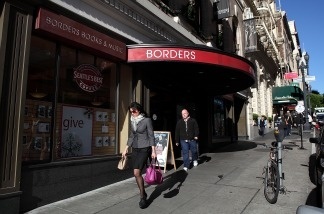 But a bookstore with music, movies, and a built-in coffee shop was a new concept—Borders has something for everyone. Now, the monster store demonized for crushing independent bookstores has now been crushed itself. By 2000, the rise of online book sellers like Amazon.com and discount retailers like WalMart and Target had caused a dramatic reduction in people visiting Borders. In addition to forces beyond its control, Borders may have accelerated its own demise by moving too slowly into the digital age, with a clunky website to purchase books from and without its own kindle (Amazon) or Nook (Barnes & Noble) equivalent until recently. With the Westwood/UCLA Borders closed and the Glendale Borders in trouble, what will be the fate of brick-and-mortar bookstores as we know them? Is Borders heading for its final chapter? Private companies want public lands for renewable energy—can it be a win-win-win?